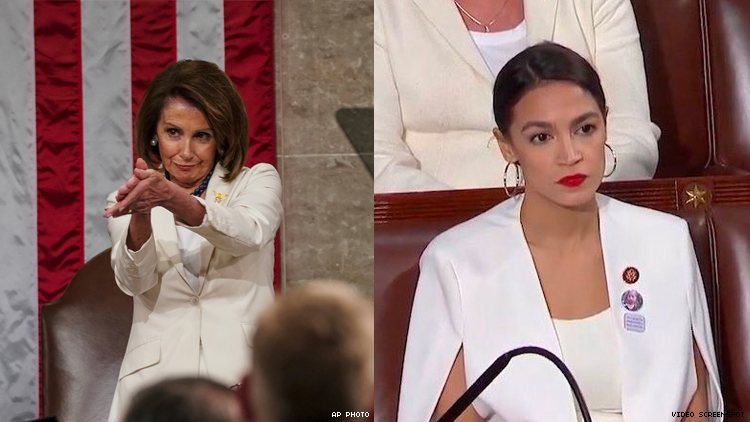 AOC, Kamala, and Nancy's faces really told the state of our union. Ah, Democrats. Not in power, but staying petty. As a television event, the State of the Union gives President Donald Trump the chance to speak directly to the people and fill us in on his agenda for the coming year. But you know what really spoke to the people? The amount of shade and side eye pouring out from female Democrats who had to sit there and endure it, Spanish inquisition style. Perhaps the most gif-ed moment of the night belonged to Rep. Alexandria Ocasio-Cortez (D-N.Y.) who remained firmly seated, even when other Democrats stood and applauded for Trump out of either agreement or sheer politeness. Wearing white, in solidarity with other female legislators, and a power red lipstick, her cold, icy stare summoned the strength of every Latinx tia and abuela who’d ever had to sit and listen to a man say something stupid. And then there was Sen. Kamala Harris (D-CA), who did her best Miranda Priestly when Trump began to rant about southern border security. Hell, just look at this sea of disappointed women judging POTUS. And then, friends, there’s The Pelosi Clap. Ah, yes, The Pelosi Clap. As Trump finished his speech and everyone rose to leave, Pelosi offered Trump a petty clap that you’d offer a child who just got a science fair participant ribbon. And of course, the Speaker and Drag Race guest judge also got a Drag Race-themed video remix with the vocals of season nine queen Shea Coulee. Trump’s policy proposals may lead us toward an eventual societal collapse, but until then we have the sweet, smile-inducing nectar of the reaction gif.